Most epithelial tissues are essentially large sheets of cells covering all the surfaces of the body exposed to the outside world and lining the inside and covering the outside of organs. Epithelium also forms much of the glandular tissue of the body. Skin is not the only area of the body exposed to the outside. Other areas include the airways, the digestive tract, as well as the urinary and reproductive systems, all of which are lined by an epithelium. Hollow organs and body cavities that do not connect to the exterior of the body, which includes, blood vessels and serous membranes, are lined by endothelium (plural = endothelia), which is a type of epithelium. All epithelia share some important structural and functional features. This tissue is highly cellular, with little or no extracellular material present between cells. Cell junctions such as desmosomes and tight junctions hold adjoining cells together. There is an exposed edge of epithelial tissue known as the apical surface and an anchoring layer called the basal surface that attaches the epithelial tissue to the underlying connective tissue. The attachment to connective tissue is known as the basement membrane and is composed of proteins. Many epithelial cells are capable of secretion and release mucous and specific chemical compounds onto their apical surfaces. The epithelium of the small intestine releases digestive enzymes, for example. Cells lining the respiratory tract secrete mucous that traps incoming microorganisms and particles. A glandular epithelium contains many secretory cells. Epithelial cells are typically characterized by the polarized distribution of organelles and membrane-bound proteins between their basal and apical surfaces. Particular structures found in some epithelial cells are an adaptation to specific functions. Certain organelles are segregated to the basal sides, whereas other organelles and extensions, such as cilia, when present, are on the apical surface. Cilia are microscopic extensions of the apical cell membrane that are supported by microtubules. They beat in unison and move fluids as well as trapped particles. Ciliated epithelium lines the ventricles of the brain where it helps circulate the cerebrospinal fluid. The ciliated epithelium of your airway forms a mucociliary escalator that sweeps particles of dust and pathogens trapped in the secreted mucous toward the throat. It is called an escalator because it continuously pushes mucous with trapped particles upward. In contrast, nasal cilia sweep the mucous blanket down towards your throat. In both cases, the transported materials are usually swallowed, and end up in the acidic environment of your stomach. 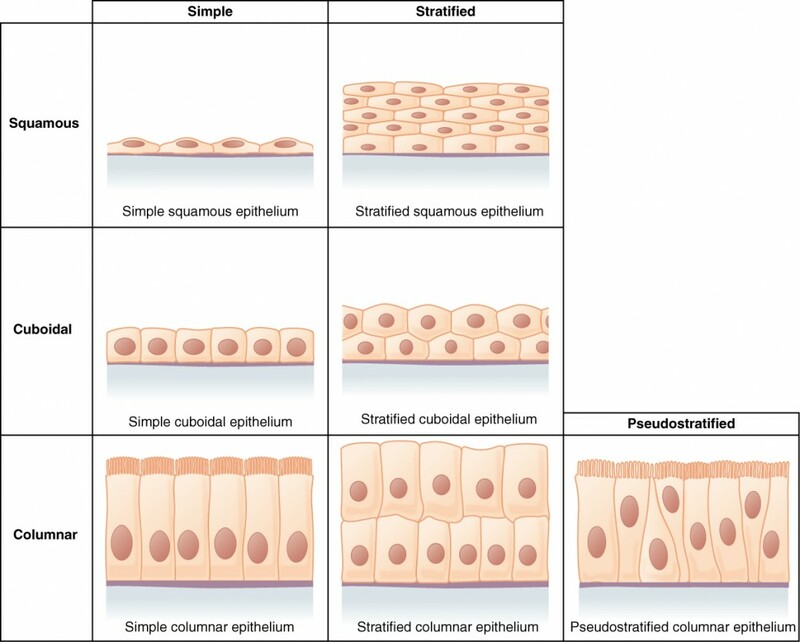 Epithelial tissues are classified according to the shape of the cells and number of the cell layers formed (Figure 4.3). Cell shapes can be squamous (flattened and thin), cuboidal (boxy, as wide as it is tall), or columnar (rectangular, taller than it is wide). Similarly, the number of cell layers in the tissue can be one—where every cell rests on the basal lamina—which is a simple epithelium, or more than one, which is a stratified epithelium and only the basal layer of cells rests on the basal lamina. Pseudostratified (pseudo- = “false”) describes tissue with a single layer of irregularly shaped cells that give the appearance of more than one layer. Transitional describes a form of specialized stratified epithelium in which the shape of the cells can vary. Simple epithelial tissue is organized as a single layer of cells and stratified epithelial tissue is formed by several layers of cells. The shape of the cells in the single cell layer of simple epithelium reflects the functioning of those cells. The cells in simple squamous epithelium have the appearance of thin scales. Squamous cell nuclei tend to be flat, horizontal, and elliptical, mirroring the form of the cell. The endothelium is the epithelial tissue that lines vessels of the lymphatic and cardiovascular system, and it is made up of a single layer of squamous cells. Simple squamous epithelium, because of the thinness of the cell, is present where rapid passage of chemical compounds is observed. The alveoli of lungs where gases diffuse, segments of kidney tubules, and the lining of capillaries are also made of simple squamous epithelial tissue. The mesothelium is a simple squamous epithelium that forms the surface layer of the serous membrane that lines body cavities and internal organs. Its primary function is to provide a smooth and protective surface. Mesothelial cells are squamous epithelial cells that secrete a fluid that lubricates the mesothelium. In simple cuboidal epithelium, the nucleus of the box-like cells appears round and is generally located near the center of the cell. These epithelia are active in the secretion and absorptions of molecules. Simple cuboidal epithelia are observed in the lining of the kidney tubules and in the ducts of glands. In simple columnar epithelium, the nucleus of the tall column-like cells tends to be elongated and located in the basal end of the cells. Like the cuboidal epithelia, this epithelium is active in the absorption and secretion of molecules. Simple columnar epithelium forms the lining of some sections of the digestive system and parts of the female reproductive tract. Ciliated columnar epithelium is composed of simple columnar epithelial cells with cilia on their apical surfaces. These epithelial cells are found in the lining of the fallopian tubes and parts of the respiratory system, where the beating of the cilia helps remove particulate matter. Pseudostratified columnar epithelium is a type of epithelium that appears to be stratified but instead consists of a single layer of irregularly shaped and differently sized columnar cells. In pseudostratified epithelium, nuclei of neighboring cells appear at different levels rather than clustered in the basal end. The arrangement gives the appearance of stratification; but in fact all the cells are in contact with the basal lamina, although some do not reach the apical surface. Pseudostratified columnar epithelium is found in the respiratory tract, where some of these cells have cilia. Both simple and pseudostratified columnar epithelia are heterogeneous epithelia because they include additional types of cells interspersed among the epithelial cells. 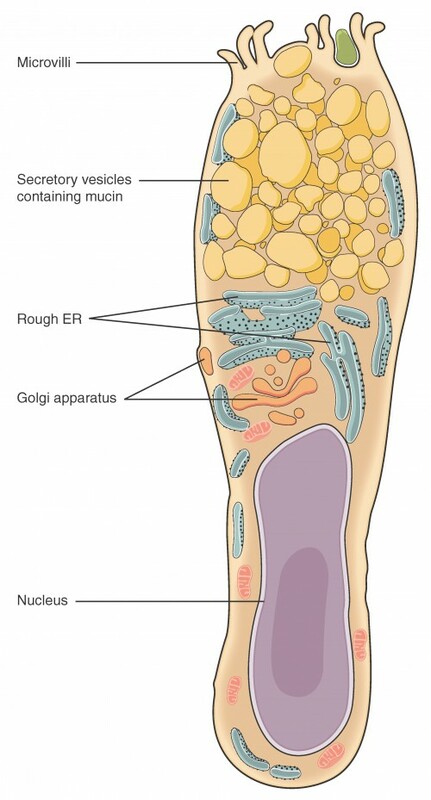 For example, a goblet cell is a mucous-secreting unicellular “gland” interspersed between the columnar epithelial cells of mucous membranes (Figure 4.4). to explore the tissue sample in greater detail. A stratified epithelium consists of several stacked layers of cells. This epithelium protects against physical and chemical wear and tear. The stratified epithelium is named by the shape of the most apical layer of cells, closest to the free space. Stratified squamous epithelium is the most common type of stratified epithelium in the human body. The apical cells are squamous, whereas the basal layer contains either columnar or cuboidal cells. The top layer may be covered with dead cells filled with keratin. Mammalian skin is an example of this dry, keratinized, stratified squamous epithelium. The lining of the mouth cavity is an example of an unkeratinized, stratified squamous epithelium. 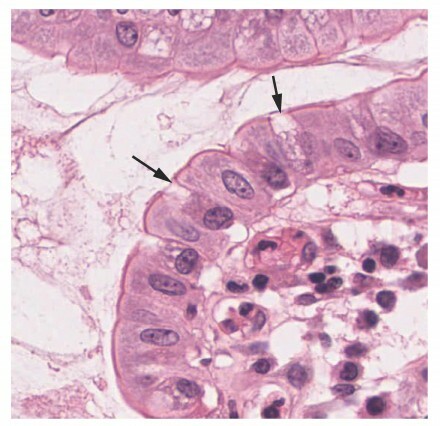 Stratified cuboidal epithelium and stratified columnar epithelium can also be found in certain glands and ducts, but are uncommon in the human body. Another kind of stratified epithelium is transitional epithelium, so-called because of the gradual changes in the shapes of the apical cells as the bladder fills with urine. It is found only in the urinary system, specifically the ureters and urinary bladder. When the bladder is empty, this epithelium is convoluted and has cuboidal apical cells with convex, umbrella shaped, apical surfaces. As the bladder fills with urine, this epithelium loses its convolutions and the apical cells transition from cuboidal to squamous. It appears thicker and more multi-layered when the bladder is empty, and more stretched out and less stratified when the bladder is full and distended. Figure 4.5 summarizes the different categories of epithelial cell tissue cells. Watch this video to find out more about the anatomy of epithelial tissues. Where in the body would one find non-keratinizing stratified squamous epithelium? A gland is a structure made up of one or more cells modified to synthesize and secrete chemical substances. Most glands consist of groups of epithelial cells. A gland can be classified as an endocrine gland, a ductless gland that releases secretions directly into surrounding tissues and fluids (endo- = “inside”), or an exocrine gland whose secretions leave through a duct that opens directly, or indirectly, to the external environment (exo- = “outside”).